Bedrabad BaisnabnagarHigh School is located under the jurisdiction of Kaliachak police station in Malda district of West Bengal. On 9thSeptember a group of students attacked its headmaster Mr Obaidur Rahman (age 50) for reportedly abusing and attempting to molest Ms Aparna Singha (age 35) who is also a teacher of the same school. The event started on 4thSeptember when Ms Singha was asked to visit the headmaster’s chamber. During the interaction, she alleged that Mr Rahman abused her verbally in sexually explicit languages and then attempted to molest her while she pleaded to be left alone. Although she could not leave initially, the headmaster relented eventually and allowed her to leave. After this, she rushed to the teacher’s room and informed her female colleagues of the torment. She was asked to remain silent for the time being.But her colleagues’ best efforts to suppress the incident failed and reports of Aparna’s attempted molestation spread across the neighborhood. The jubilant march of activists and supporters of Trinamool Congress on August 25, 2013 after successfully forming the Panchayat board at Bhagabatipur under the jurisdiction of Chanditala police station in Hoogly district turned into havoc for villagers living in Kanaidanga. The village comprises a sizable number of Hindu Barga Kshatriya families who belong to the scheduled castes and are known to be CPM supporters in the neighborhood. It has been learnt that initially there was no plan to enter the village of Kanaidanga. The decision was taken later on by Haji Rabiul Mollah (Kanu) who is enjoying high status of a strongman in TMC these days. The march was being led by Mohan Bag and Srikanta Bag while Haji was in the forefront. Kumargunj under the jurisdiction of P.S. 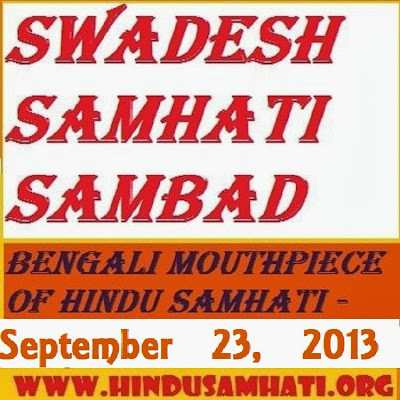 Tamluk, Block: Tamluk, District: Midnapur (East) experienced a brawl between two religious communities leading to a violent clash around 5 pm on September 9, 2013. It has come to knowledge, the problem started when a few Muslim youths asked a Hindu trader of Kumarganj market to either close down or relocate his shop to somewhere else to make their own club there. Dipankar Das, owner of the shop and also a supporter of Trinamool Congress, denied the offer flatly ensuing a heated argument. Dipankar was also joined by a few people soon and he decided not to give up. 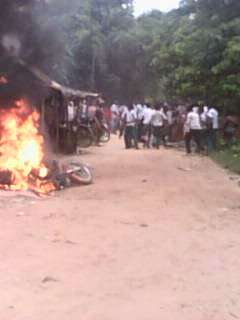 Finding it hard to deal with Dipankar, Muslim youths went back to their area only to return with more rowdies. While the fracas was in full swing, someone struck Dipakar with a rod. He fell on the ground and fled. But others supporting him then were not spared. They were beaten black and blue with all kinds of blunt instruments. In the morning of 31st August, a mob consisting of Muslim miscreants attacked and destroyed several shops and severely beaten the shop owners in Sarberia area of Sandeshkhali police station in North 24 Parganas district. Mr Bhombol Pramanik and his son Bapi Pramanik from Charabidya village were severely injured in these attacks. When police failed to control the situation, RAF has been deployed. But RAF too were attacked by the Muslims. 4 RAF personnel were injured and one police vehicle was fully damaged. Over a thousand strong mob roamed the adjoining areas of Sarberia, Rajbari and Agarati while communally provocative announcements blared loudly from the loudspeaker’s Rajbari Purbapara mosque.